A little while ago, I was involoved in a few challenges for Christmas. One was a colour Challenge using Real Red, Basic Black, Basic Gray and Kraft. I decided to make up a little gift box to put those Christmas Chocolates in that we like to give! Boxes are so quick to make and you are only limited by your imagination with the decorating of them! I have used a belly band, which I ran through my Big Shot and embossed. The image is from Welcome Christmas, and I have used a Real Red mat and teamed with a Red satin bow. The belly band is textured (which is hard to see in this photo), so I left the majority of the box quite simple. I have also added faux stitchng to the tag and top of the box. Today is the Totara Park Extravaganza. My team (Paper Diva's) and I will be teaching a variety of Christmas projects to a room full of ladies. I can't wait to show you, over the next few posts, what we all got up to! Be sure to check back to see what all the fuss has been about! Remember Daisy Chains? I remember making heaps of them as a child!! This weeks fabulous #41 challenge at JUST ADD INK is to just add BIRTHDAYS, and so I went back to my childhood for this one! The Daisy stamp I have used is from a fabulous new set called Every Moment. This is such a versatile set and I love it!! I have pulled out my brayer again - YES- I am getting brave! This is a fabulous tool to add colour fast! I have masked the daisy over and over and stamped repeatedly to get the chain along the top of the card. Then spent time cutting around the outline to give my card an uneven top. The sentiment is from the level 3 Hostess Set, Occasional Quotes, which is full of delicious sentiments for all occassions! This is a FREE set you can earn when hosting a workshop, which you can book with me! I have also carried the image and colour along the bottom of the inside panel. I am really happy with this card, simply because, for a few weeks, I have been unable to come up with ANY designs! I know how writers feel now when they have writers block! I think the block has gone and to prove it to you, check back in a day or so for more creations I have come up with since! I promised to show you some of the gorgeous creations that have been sent to me by mail, from Stampin' Up! freinds over the past few weeks. It is so lovely to think that someone had made a card (or project) with you specifically in mind. It is also lovely to get these for no reason at all!! Beats getting a bill any day, lol. Thank you Helen H, Bron and Helen W - you have no idea how much you brightened my day when I got these!! These ladies have become great friends, even though I have never met either Helen! I have had the great pleasure to meet and spend time at Convention with Bron. 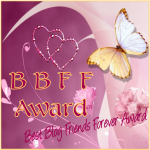 I would like to show how much they mean to me by passing on the Best Friends Blog award given to me by another friend, Andrea Lowcock. I hope you will share it with your blogging Best Friends too! will always be sponging! I haven't had much chance recently to break them out again, so I made a concerted effort to use them on his wee Christmas Card. I love the control I have when applying colour to my card stock. I can really blend colours nicely with sponges. The brayer works wonderfully too, but I find I don't have as much control. perhaps becuase I am not so proficient with it yet, lol? I have used a new set of stamps for this card called "Welcome Christmas". As you know, my loyal followers, I really love silhouette images. Instead of using black (like I normally do) for the silhouette, I chose to use Night of Navy instead. With the sunrise colours, it doesn't look quite so harsh. I have kept this simple again by opting not to use any embellishments too. Again, non traditional colours, but what the heck, I love the way this turned out! Who said you had to stick to Red and Green for Christmas? Not me! 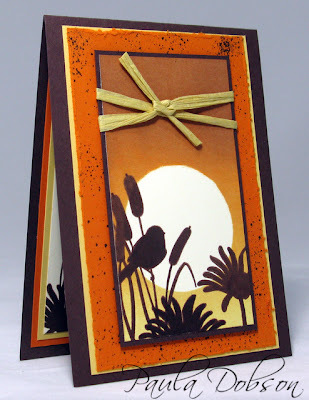 I thought I would try out very untraditional colours on this card by using Brown and Orange! I quite like how vbrant it turned out. I also pulled out my brayer for this wee baby. Michelle Zindorf has always inspired me and I would love to be as profficient with a brayer as she is. You NEED to go check out her work. The woman is a true artist. For a long time though, I was too scared to learn how to use this wonderful tool and took up Sponging instead. Don't get me wrong, this turned out to be a GOOD thing, as I found something I was good at and really loved to do. However, we have to push ourselves to try new techniques, and I must say it is not nearly as difficult as I thought it would be! I have used a brayer to get the graduation of colour you see in the sky. Masking has helped me define the snow, add the trees so they appear in the distance, and given me "white space" to stamp my image of the reindeer. I have also used my Colour Spritzer tool to add a bit of interest to the front panel. If you would like to learn how to use a brayer to good effect, email ME and book a class. I would love to show you how! I have been playing around with the level 1 Hostess set "Birthday Bakery" recently and while the design is really simple, I really liked this little card and thought she would too! Pinks and Browns together, I think, are really feminine, and was quite pleased the with the end result. I used Lots of Tags die to create the tag and the new beautiful Satin ribbon in Early Espresso for this card. Love both of these new additions to my stash! If you have a look at my previous Birthday Bakery card, you will see I have used the exact same colours in the artwork! I coloured both images at the same time! It never fails to amaze me how the same piece can look so different just by changing the colours and using a few more (or less) embellishments on the card! Hope you like this as much as Diane did! We have a special challenge this week at JUST ADD INK to help raise awareness of Depression and Anxiety. The whole month of October is Anxiety and Depression Awareness Month. Over a million people in Australia and New Zealand live with depression. Over two million have an anxiety disorder. With the right treatment, most people recover. It's easy to help raise awareness. Sometimes the simplest acts have the greatest impact - just talking openly about anxiety and depression helps reduce the stigma. beyondblue Anxiety and Depression Awareness Month provides an opportunity for workplaces, community groups and individuals to take part in activities to raise awareness of anxiety and depression, and help reduce the associated stigma. While my entry was made before this challenge was set, it is still very BLUE and I wanted to share it with you anyway. Who said Christmas cards had to be red, green and gold!! I have used Tree Trimmings, Welcome Christmas and three different Blues to create this card. Night of Navy, Bashful Blue and the new Marina Mist. I have also added a bit of bling in the form of the stick on Rhinestones Stampin' Up! released in the new catalogue - arent they yummy? Christmas is coming up so fast and if you haven't made a start to your cards, why not start with this one. I can bring this class to you. Email ME for more information! In the meantime, pop over to JAI and have a look at the beautiful entries from the Design Team this week. Add yours and play along! I am so fortunate to receive lovely comments from my readers, kind and encouraging words from my students, and blog awards from my fellow demonstrators. 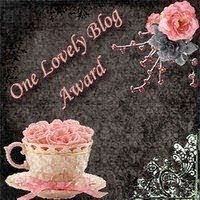 I received this gorgeous award today from Melissa Davies, who lives in Australia and whom I have never met in person. We share a love of paper craft, and also share encouragement. Sometimes these things are given right when you need it most and Melissa did just that for me today. I am going through a bit of a design drought at the moment!! Anyway, I would to share this award with some demonstrators that have inspired me or helped me in some small way, to give back some of that encouragement. Please visit their sites and leave a little love too! I love the Every Moment stamp st in the new catalogue (actually, I have quite a few favourites, lol). It is a line art stamp, which allows you to add your own touch by colouring. I haven't used it nearly enough, but I wanted to share this wee baby with you. I made it especially for Danielle Daws, who does a wondeful job (along with Amanda Reddicliffe) keeping the Just Add Ink site exciting and fun! She got quite a few cards from the rest of the DT too, pop on over and have a look! I chose to use this as a silhouette again on a brayered sunset background. I am thrilled with the overall look of the card. I have grunged the edges of my cardstock and used the Colour Spritzer to add splatter to the Pumpkin Pie mat. A bit of Raffia finishes the front nicely and really compliments the colours I have used. I carried the image to the inside of my card too and added the birthday sentiment there. I havemade a start on my Christmas Cards - have you? One of my favourite sets that was in a Mini catalogue last year has made it back into the new catalogue this year - TREE TRIMMINGS. These cute baubles look great on a card or as tags by themselves. This card was for the Inkspirations4U Online Christmas colour challenge, using Old Olive, Cherry Cobbler and Early Espresso. Real Christmassy colours! I have made an easel card for this cahllenge and am thrilled with how it turned out. I am really enjoying the new colours Stampin' Up! have in the new catalogue. Intially I was disappointed some of my favourite colours were going, but just look at ones they have replaced them with! So beautiful. If you would like to make a start on your Christmas cards, why not book a class with me? I can taylor the class specically for your needs! Drop me a line and book one today! I guess, they don't call them challenges for nothing! Head over to JAI to see the gorgeous designs the rest of the Design Team have come up with. I know their creations will inspire you to join in and have a go too!